"You have to keep an icy cool head to conduct Tristan and Mahler's Ninth, whatever is going on in your heart," Sir John Barbirolli once said. It's important to bear this quotation in mind when you listen to his interpretations of Mahler and especially this "live" recording of the Fourth Symphony made with the BBC Symphony Orchestra in Smetana Hall, Prague in January 1967. For although Barbirolli was always of the "interventionist" school of Mahler conductors his brand of expressionism never sprang from self-indulgence, rather a wish to serve the music and the composer as opposed to himself. After Sir John's death, Michael Kennedy found a quotation from Bertrand Russell in the conductor's papers: "Nothing is achieved without passion, but underneath the passion there should always be that large impersonal survey which sets limits to actions that our passions inspire." So it is in this Mahler Fourth. There is about it a remarkable air of calculation underpinning the high emotion and has the effect of throwing a frame around what, under other conductors, might sound like hamming. The feeling that thought, planning and care has gone into every bar and, perhaps most important of all, every sound. For this is a recording where the particular sound of this symphony has been rendered to a more vivid degree than I have heard in many a long time. There are problems. This is an orchestra that was not one Barbirolli worked with often and it was also recorded on tour with all the dangers to ensemble and note perfection that brings. 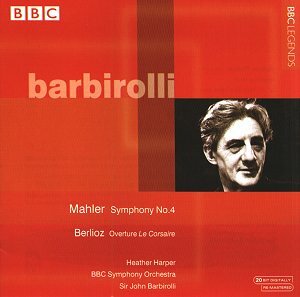 All the same, this is Barbirolli's Mahler beautifully represented and in a work he never recorded commercially. It has appeared before in inferior transfers. One of them (on the Intaglio label) was off-pitch and had a couple of bars missing from the third movement. Clarity and sharpness is what this new CD produces with details that conventionally-recorded versions often miss and infinitely more than the previous transfers ever gave. A big plus when Barbirolli is so anxious to recreate a special sound world. If you like Mahler's Fourth fresh and pure (like under Reiner, for example, or even Horenstein) or childlike with an innocence and a "Wunderhorn" quality (like under Kletzki or Kubelik), go no further with Barbirolli. His reading is more towards a performance in the Mengelberg tradition: a case of putting yourself in the hands of the gnarled old storyteller, warts and all, and surrendering to him. You could say this is Mahler's Fourth seen in retrospect from Mahler's later works. Barbirolli doesn't indulge in quite the excesses Mengelberg does in his old 1939 recording, but I do think he is closer to Mengelberg (and Bernstein) than anyone else. Yet that "large impersonal survey" never deserts him, until the very end at least. In the tapes made by William Malloch of the old New York players who remembered playing under Mahler himself we hear how the composer would interpret the opening theme of this movement and it's as if Barbirolli heard this too, for in the fourth note you can hear the same slight drag that in Mengelberg is so accentuated it can annoy on each rehearing. Under Barbirolli it has the effect of a rather arch "Once upon a time" and is utterly charming. Likewise his rendering of the second theme, which is marked "Broadly sung", where Barbirolli takes Mahler at his word. But that appears to be the hallmark for the strings, cellos especially, in this whole performance. I'm willing to believe many who know Barbirolli's recordings would be able to identify this as his work in a blind test. But the strings don't predominate. One of the special glories of this recording is the prominence given to the woodwinds, with some very particular phrasing in the oboes early on which will make anyone who knows the work sit up and take note. I also loved the sound of the bassoon against the high flutes in the development; a reminder of Mahler's propensity to pitch highest and lowest against each other that would reach its apogee in the last movement of the Ninth Symphony. In sum, I think Barbirolli sees this movement's darker, unhinged side. The pizzicatos and spiky high woodwinds really protrude from the texture Grimm-like. As we approach the central crisis of the development it's as if Sir John is trying also to extract the maximum amount of drama from it, so the section between 221 and 238, which contains the "Kleiner Appell", is huge and almost overwhelming. But the passage marked "Mit grosser ton" a little later is even more so. Barbirolli clearly sees this as the true climax. A real kaleidoscopic first movement, then, with many details to be heard. The second movement continues much of Sir John's groundwork from the first with every detailed attended to. I liked the woodwind chuckling attractively in the Trios and the clarinet shrieking like a startled bird. In performance Sir John invariably positioned his harpists at the front of the platform, right beneath him, and this may account for the fine prominence of the harp in this movement and in the performance as a whole. The way, tolling bell-like, it underpins the texture is another memorable sound to come out of this recording. The harp underpinning is again apparent in the third movement which receives a performance in the grand Barbirolli manner, spacious and well-upholstered, broadly sung but also very consciously moulded with the most elastic approach to tempo in the whole symphony. There are passages here where I was reminded of Scherchen's Mahler (not that he ever recorded this work) rather than Mengelberg's, especially in the way tempi suddenly take off at a great speed only to be reigned back suddenly. There are many fine points of detail brought out again, though. Most notable are passages for the woodwind that take on an autumnal sound colouring. Just before the passage where the gates of heaven are flung open (283-287) Sir John achieves a real sense of stillness akin to that at the end of the Ninth symphony and which makes the outburst that crowns the movement that much more towering. He gives his timpanist his head here also and those who have the old Intaglio aircheck CD will be pleased to hear the two or three bars missing from that are restored to us in all their glory. I want to pay special tribute to the coda of this movement under Sir John. He sees a perfumed garden, exotic and hazy, and I couldn't help but see Mahler here as a very distant musical cousin of Frederick Delius and, great Delian that he was, wondered whether Barbirolli did too. It may not be to everybody's taste, like the whole of the performance, but it certainly stays in the mind. The last movement is a relative disappointment. For one thing, marvellous though she sings, Heather Harper has, for me, the wrong kind of voice for this movement. She is far too matronly, far to correct, for the boyish quality that is surely needed. Barbirolli also does himself no favours by adopting a very slow tempo for the stanzas and an even slower one for the final stanza of all. The effect is therefore too dreamy most of the time, broken only by the sudden jolt of his quicker tempo for the incursions of the bells. It would be wrong to let this reservation spoil what is a remarkable, if very individual, reading of the work which has needed to be restored officially to the catalogue for years. The Berlioz Corsaire Overture that completes the disc was recorded in the same concert and that explains the incongruous coupling. It's a fine performance, cutting quite a dash, but is completely out of place straight after the Mahler. Admirers of Sir John and particularly his Mahler can buy this with confidence. Those with a Mahler palette ripe for the taste of a strong vintage should uncork at room temperature and prepare to savour every mouthful. Those whose Mahler palettes are rather more delicate should seek out something a little lighter to the taste.